If you haven’t grown up around children, taking those first steps to giving your baby solids can be quite daunting. Naturally, you only want the best for them and want to give your baby solids at the right time for them. The general consensus is about six months and the first time you see your little one taste ‘real’ food is quite a magical moment. Here are some products that can make those steps a little easier for you. I began with some baby porridge, which my little one absolutely loved and is a great choice for mornings. It is easy to make and you can add a little mashed banana. He also loved avocado, sweet potato and butternut squash. To be honest, I think everything that he tried, he enjoyed. If you have read my previous posts you will know I am a working mum, so once in a while having something to hand that doesn’t need to be steamed first makes life a little easier. However, like all mums I am particular what passes my little one’s lips. 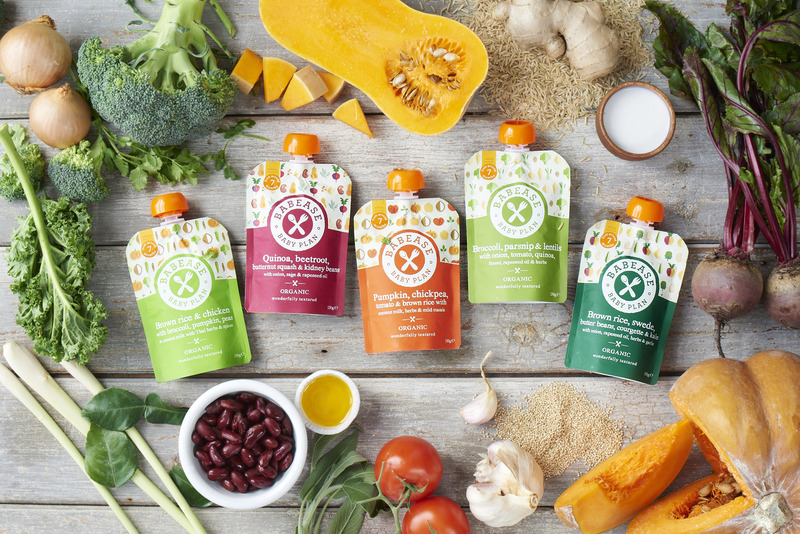 I discovered Babease baby food, which is a vegetable led weaning food and made with premium organic vegetables. To be sure you know what you are feeding your baby, all the ingredients are listed on the front and back of the pack. For those with added fruit, they don’t use more than 30% fruit, keeping the sugar levels low. My little one enjoyed them all. Babease baby food is available directly from the website and are great value at only £1.19 each. I found a little goes a long way, so one packet covered two meals. Your little one is guaranteed to make a mess, so bibs are a necessity. 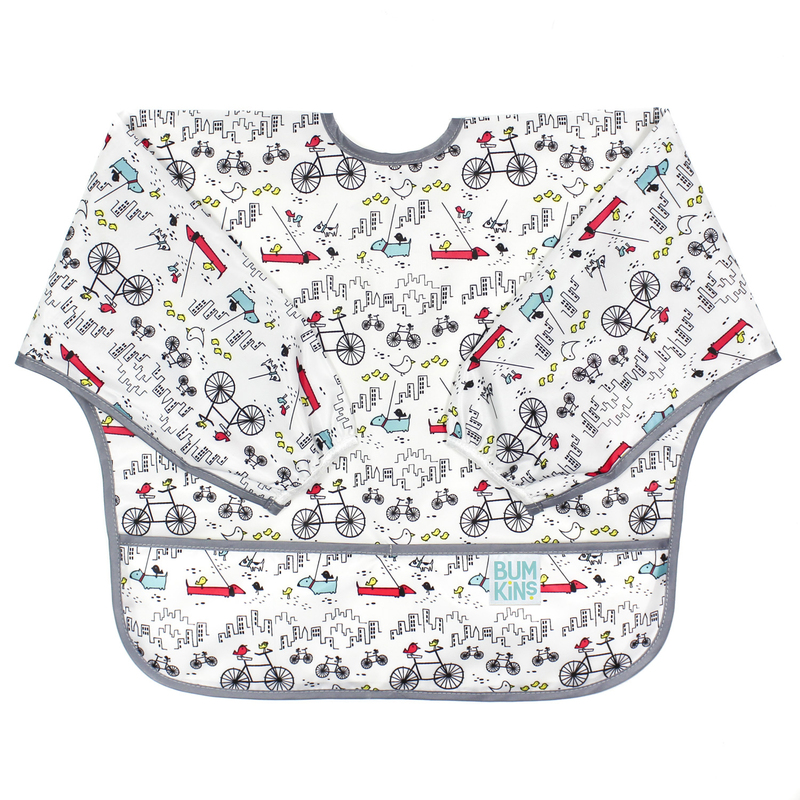 HippyChick bumpkins sleeved bibs are made from easy to wipe and waterproof plastic, which saves on washing and unlike material bibs, can be worn again and again. They are great for playtime too and are generously sized so last from 6-24 months, which makes them excellent value for money. The last ingredient that you need for your first transition to solids is a plate and baby cutlery. Although I have a couple of sets of baby plates, my absolute favourite is the BabyBjorn plate, fork and spoon set. They come in a set of two, one orange and one blue set or pink and lilac. 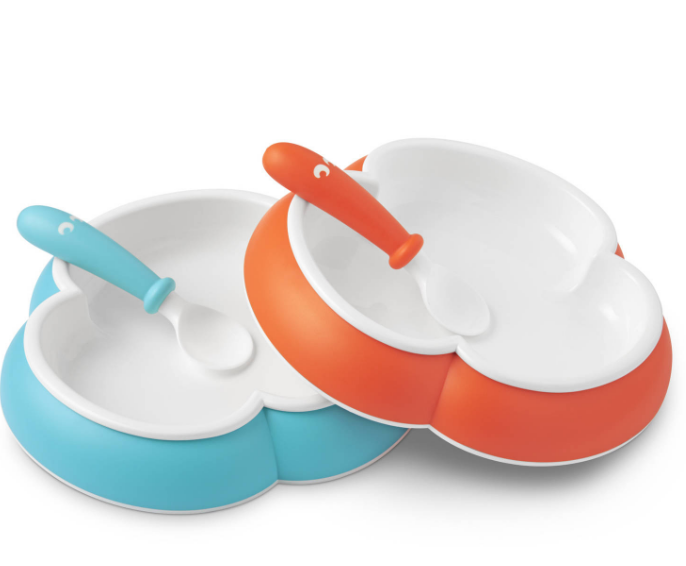 The plates are heavy enough to stay in one place and the top detaches from the bottom of the plate, which makes them easy to wash.The shape of the rim also makes it difficult for the child to grab hold of and this minimises the risk of your child tipping or throwing the plate. The rubber edging underneath prevents the plate from sliding about on the table.The knife and fork are grip friendly, for when you bundle of joy is ready to try to feed themselves. They are suitable from 4 months old.